Description: Vincitore wears the white traditional Espada attire, his pants is however not baggy and was tailored made to fit. He also wears a sleeveless top underneath his overcoat which stretches down towards his Shin. Vincitore is also of a muscular built and stands at 6’3 with his Hollow hole located in the center of his stomach. In addition to his clothing he also wears a pair of black fingerless gloves. His Zanapakuto can be seen strapped to his hip and even at times being worn diagonally across his lower back with the hilt of his sword just inches away from his hand. Vincitore also has Long white spiky hair that is mane like in appearance causing him to look rather wild. His eyes are also crimson red and at times looks cold and demonic. Covering his head and often his eyes is a white straw hat, with Black stripes around the edges of the hat. Vinctore’s skin tone is of a tanned color and located on the back of his neck is the number that he was given as an Espada. It should also be noted that while Vinctore is quite old he appears to be in his 20’s, 21 years of age to be more precise. And even though he’s an Hollow he is also quite handsome. Personality: Vincitore is a very laid back and reserved person at times. Only speaking when the situation demands it. He likes to observe and come to his own conclusion about certain things in life. He is also very perceptive and tend to be a lot more cautious than reckless. Most of the time he acts rather shy, but that part of his demeanor will be quickly tossed to the side during battle. Vincitore will no longer be this seemingly kind and shy person. It will be as if something else takes over from him. And it shows through his merciless actions at times. Vincitore's personality tends to be quite complex and is known to be somewhat of a two face. And so his personality is not stable in that sense, since he could easily come out his shell and engage in quite a few interesting conversations. He is not the type of person to be easily intimidated and will most likely shrug off any attempts that another person may try at intimidating him. He enjoys training and continuously reaching new heights as far as his strength is concerned. Vincitore is also the type never to pick a fight, but hardly ever backs down from one. However he is also very calculative and will never fight a losing battle no matter what anyone says. Most of all he can be a very Cunning person and can be seen forming a fox grin on his face, which means he's either amused by something or he's possibly up to no good. Apart from his other perks, he enjoys drinking sake and surprisingly will even drink with the enemy. 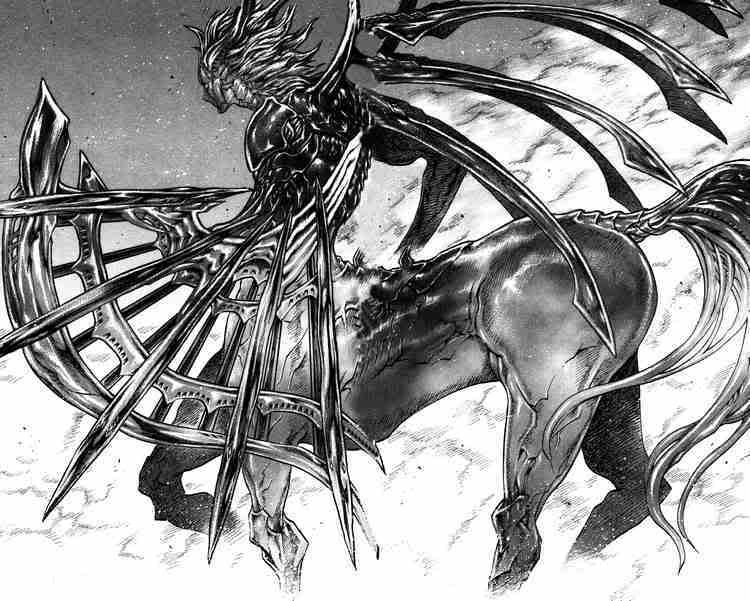 Ressureccion Information: Once in his released state Vincitore’s whole body will become a weapon, with the Hierro on his entire body becoming even stronger. The blades on his hands are capable of slicing and impaling opponent(s). The blades on his back are also capable of doing these things. Vincitore’s hooves will also be quite powerful and a kick or stomp from him can possibly break bones too. His tail is also known to be as strong as his Hierro and can be used as a weapon too against his opponent(s). A simply tail whip can cause cuts like any regular sword due it being sharp. The Grim Stallion's ability is based around infecting whatever it touches with a deadly disease. This is done by the millions of deadly bacteria that is contained within Vincitore’s attacks. The bacteria will decompose materials and even flesh or anything that has a solid form. Although it is not instantly and will usually take a certain amount of time for it to completely decompose whatever is infected by it. It does however carry other adverse effects too. Once someone have been infected by the deadly bacteria, they will slowly start to feel the effects that will become noticeable over time. 5th symptom Once the disease reaches it’s final stage it will then end in the Victim(s) becoming completely paralyze 8 posts. Also another thing to note is that a small cut can become fatal, due to the bacteria constantly eating away at the flesh which means a small cut may expand into a wider and deeper one. This will take the same amount of time which will be over 12 post. Description: This particular ability of Vincitore revolves around him coating his blade in the deadly bacteria that causes the disease. Once Vincitore cuts his opponent(s) even if its a small one. The bacteria will then aim to get into the blood stream of the victim and by doing so will infect them with the deadly disease known as Muerte Plaga. Description: Using his long mane like hair Vincitore will have it extend up to 6 ft, his hair will be just as strong as the Hiero on his body and will aim to either impale of scratch his opponent. This sheer numbers of his strands of hardened hair will also carry the same infectious disease. It will only take a scratch in order for the Victim(s) to become infected by the disease. Description: Impuro Cero is Vincitore’s own personalized Cero that is mixed with the deadly infectious bacteria that he produces with every attack. Being mixed with another substance of sorts the Cero will change in appearance. To a dark gray Cero that carries the same effects of the Muerte Plaga. This also causes the Cero to have a double effect in terms of its capabilities. Description: This techniques create a dark dome that protects Vincitore from the abuse of the elements and other forms of attacks. The dome is also quite strong and can withstand a lot pressure, unless he is fighting someone that is far more powerful than he is. Located all over dome however are a couple of spikes that carries the same deadly bacteria like all of Vincitore’s attacks. The spikes may also be launch and will reach up to 8ft whilst still on the dome. Once the spikes have been launched they tend to travel very swiftly and never seem to lose there momentum. And as expected a simple scratch from any of these spikes will see the victim become infected. Description: By a simple swing of his sword Vincitore will release what looks like a decomposing skull that reaches up to 12ft in both height and width. This particular decomposing skull will begin screaming in pain once released at break neck speeds. The aura around the skull carries an intense heat capable of burning and by doing so infecting whatever it touches with its deadly bacteria. The force of the attack itself is also quite strong which makes the attack itself quite versatile. Description: This is possibly one of Vincitore’s most devastating attacks. Vincitore will create 4 horsemen that resemble the grim reaper riding on horses that are nothing but bones. These horsemen wield swords and spears which is divided amongst them. The aura surrounding the horsemen is also quite deadly and carries an intense heat. These particular riders will also aimed to cut down and impale or even to trample all those that stands in their way. And as one would expect these riders also carry the same infectious and deadly bacteria. They’re also quite impressive in terms of speed, since once they start galloping they can then suddenly break into a Sonido which makes them unpredictable at times. These riders of death also possess the ability to protect themselves and also to attack. Biography: Vincitore Hizato was born in Karakura town into a loving family and live a rather normal life too. There was something that stood out with Vincitore and that was his ability to see ‘Ghosts’ or ‘Monsters’ as he would often refer to him. Being ignorant of the fact that these beings were known as Hollows. Vincitore wasn’t aware of just how spiritually aware he had become while growing up, until he saw a Shinugami fighting against an Hollow. It was during this time that he started paying more attention to the battles that waged on. And by doing so he gained some knowledge about the horrors of these ongoing and never ending battles. There were instances when the so called Monsters would get the victory, then again you lose some and you win some. Reaching 18 years old and almost fully grown in terms of his maturing body, height and appearance. Vincitore was soon met with tragedy which brought about a new beginning for him. Shortly after turning 18 Vincitore along with his Mother and Father was murdered and unlike them he didn’t reap the benefits of a soul burial. Instead he was left to wonder as a plus soul in the human realm not sure about what was happening to him at all. Loneliness and despair filled Vincitore’s heart which brough about yet another change for him. Unaware of the consequences of these emotions, Vincitore started transforming into an Hollow shortly after becoming corrupted. His chain of fate which was long enough started becoming shorter and shorter a lot quicker. And noticing this Vincitore became even more angry and hate filled his heart without him even realizing it. Suddenly he was transformed into an hollow and a fairly mindless beast with only one thing on his mind and that was to consume as much souls as possible. His hunger grew stronger and stronger and it wasn’t before long that he was feeding on the other plus souls and even at times on his own kind. He had a lust for power and he knew the hollow way to accomplish this was to consume as much soul as possible. This was however based on his primal instincts which came rather naturally to Vincitore. After gobbling up as much souls as he could, Vincitore soon found himself in Hueco Mundo among other hollows like himself too. During this time Vincitore went about his regular routine which was kill or be killed until something changed once more. There was yet another call and he answered it. And by doing so Vincitore found himself lost in a conglomerate of Hollows and effectively becoming a Menos Grande. For most hollows it would have been the end for them, but still that desire was there. And yes Vincitore kept on desiring more until he became the supreme consciousness instead of walking around as a towering giant known as the Menos Grande. It was time again for another evolution and Vincitore did evolve into an Adjuchas class hollow and by doing so regained his consciousness. He now had the ability to think for himself and even the ability to speak for the first time in so many years. It was during this time that Vincitore gained his true form unknown to him would be his Ressureccion form sometime later in his life. Sensing the danger of not consuming any Hollows Vincitore went on the hunt again and began devouring as much Hollows he could get his hands on. He fed on the Menos Grande and other class of hollows in his class on a daily basis. And no matter how much he ate he never seemed to get his fill of Hollows, at least nothing that would satisfy this hunger of his. Vincitore found himself traveling Hueco mundo constantly seeking to devour more and more Hollows alike. That’s until he came across another very interesting Hollow and instead of trying to feed on each other. They decided to go on a quest for some unknown reason as if it was meant to be. And this quest of theirs revolved entirely around becoming a Vasto Lorde class hollow. Both of them found themselves devouring other powerful hollows like themselves and in turn growing even stronger. This of course took centuries and one must say it was worth the wait. That’s until tragedy struck once more and Vincitore lost a close friend during battle with another group of Hollows that sought to devour them also. Sensing that his time was near, Vincitore’s friend asked a favor of him which he did quite reluctantly. It ended in with Vincitore devouring his friend and gaining the very strength that this friend of his possessed making him even more powerful. With his new found strength Vincitore sought out the remnants of the Hollow group that caused sadness to fill what he would call an hearth once more. And without mercy he devoured them. Closing that chapter of his life Vincitore was once again alone until he found himself in the presence of another set of Hollows. This set however were very different, no they were more evolved than he was. Sensing his strength that laid dormant within him, they could tell that Vincitore was in the same class as them. He had finally become a King or rather a Vasto Lorde class. And it was this group which consisted of 3 that showed him out to remove his mask on take on a more humanoid form. It was another evolution for Vincitore and in appreciation he spent he rest of his time honing his skills for centuries, even become quite adapt at using a Zanapakuto. As for the future, well no one knows that will bring for Vincitore and he doesn’t seem all that optimistic about it either.